So I've deactivated my Facebook account. Are they better or just different? Probably the latter ... but in the end should it matter to me? Should it affect how I view myself and the decisions I make? Generally no! Every day there will be new "Pinterest Pretty" photos of some meal or project someone has devotedly made for their family. Until I reclaim my status as a daughter of the One True God, who loved me enough even in my worst state to send His only Son, who willingly stepped down from the right hand of God's throne to die so I could have a relationship with Him ... until I can do that I feel like I need to stay away from Facebook. I also realized that though it is a social network, it is centered around me. Last time I checked I was not the center of the universe. I would really like to focus on loving others rather than promoting myself. And while a blog is probably even more self-centered than Facebook ... at least it is not pushed on you. While I think Shelby is adorable and know many agree ... you have the choice to come here and see her picture rather than having it shoved onto your news feed. 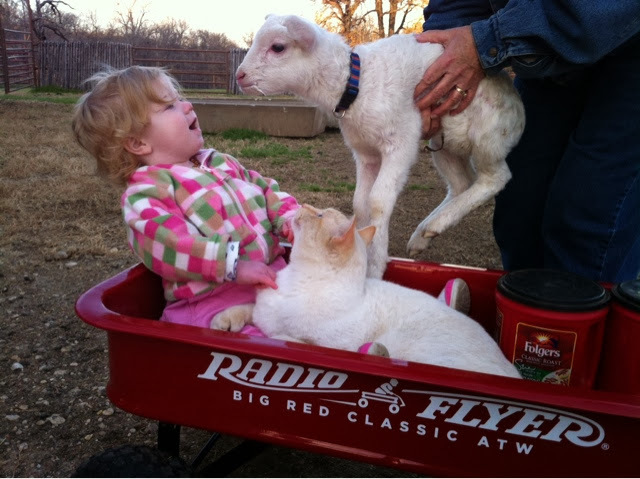 And you can ooh and aah over the cuteness of our lil lamb and a recent orphaned twin at the farm in peace. And I don't only have to write about us, though that is what I am most familiar with. Speaking of us, we are underway in building the barndominium. I'm actually thinking of shifting the title of the blog to be a little more along those lines. The foundation is being poured as I type this and the outer part of the building is waiting in the warehouse to be put up. Once Tim starts working on the inside, I imagine that will be much more interesting than life as a paramedic's wife. Which is a lot more exciting than I share on here but a lot of that just doesn't seem appropriate to make public. Might I reactivate Facebook someday? Maybe. But until them I'm going to reclaim those snippets of time scrolling through and making sure I didn't miss anything for things like writing. And reading. I don't really intend to add arithmatic to that until we're homeschooling though.